Culling through the Winter/Spring 2010 volume of the Crab Orchard Review, published twice yearly by the Department of English, Southern Illinois University in Carbondale, I found this darkly whimsical play on Japanese imagery and knew I had found this week’s poetry pick. According to the Contributors’ Notes at the time publication, the author of this poem – Tara McDaniel – is a student at the Bennington Writing Seminars. Her previous work has been featured in Cimarron Review, Marginalia: The Journal of Innovative Literature and Gloom Cupboard. On a bed of velvet. A little key behind one eye. To cough up the key, graze her claw over my door. 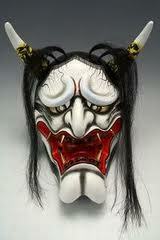 Note: Hannya is a mythological Japanese character, a vengeful and jealous female demon. She is represented in traditional Noh theater by a horned mask. This entry was posted in Zingara Poetry Picks and tagged Crab Orchard Review, Hannya, Japanese Ghost, My Stepmother Having Returned to This Earth Becomes Hannya by Tara McDaniel, Noh, Southern Illinois University, Tara McDaniel on May 11, 2011 by Lisa M. Hase-Jackson.